The supplying of capital for large undertakings, a characteristic of modern forms of commerce. As distinguished from the more passive side of banking, the reception of deposits, it may be described as the active aspect of a banker's operations. The earliest beginnings of finance are probably to be found in the money-lending of the Middle Ages (see Usury). In the modern form, however, the origin of financial operations came with the need of large sums to supply the armies of the Hapsburgs and the Valois in the sixteenth century (see Ehrenburg, "Zeitalter der Fugger"). Jews had nothing to do with this except in so far as the Antwerp firm of Mendes may have assisted Charles V. It was only with the gradual accumulation of capital in Jewish hands during the seventeenth and eighteenth centuries, when such capital was to a certain extent free from government interference, that any Jewish activity in finance began. The court Jews of Germany, who had acquired a certain amount of capital by the purchase of loot during the Thirty Years' war, and the Jewish frequenters of the Amsterdam bourse (of which the London exchange is only a "filial") in the eighteenth century, were the earliest examples of Jewish financiers. When Napoleon captured Holland, the financial center of the Anti-Napoleonic league was transferred to Frankfort-on-the-Main, where the house of Rothschild obtained its prominent position in the financial world. With the peace of 1815 came the beginnings of international finance, in which industrial operations in one country were assisted by loans from financiers of other countries. The Jews, through their international position, were the first to combine into syndicates for such purposes, and the earlier stages of national loans and the larger industrial operations—especially those relating to railways—were largely financed by means of Jewish capital. Even in cases where, as in England and the United States, there were large bodies of capitalists ready to advance money, the actual operation was often conducted by means of Jewish firms. 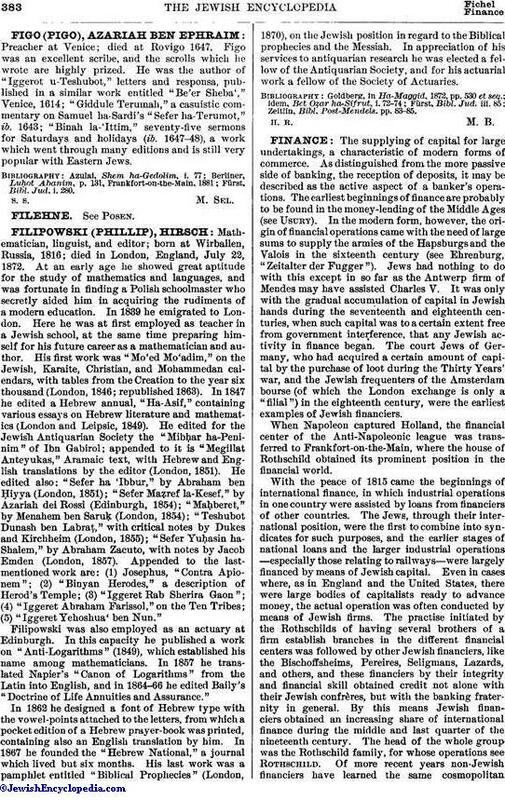 The practise initiated by the Rothschilds of having several brothers of a firm establish branches in the different financial centers was followed by other Jewish financiers, like the Bischoffsheims, Pereires, Seligmans, Lazards, and others, and these financiers by their integrity and financial skill obtained credit not alone with their Jewish confrères, but with the banking fraternity in general. 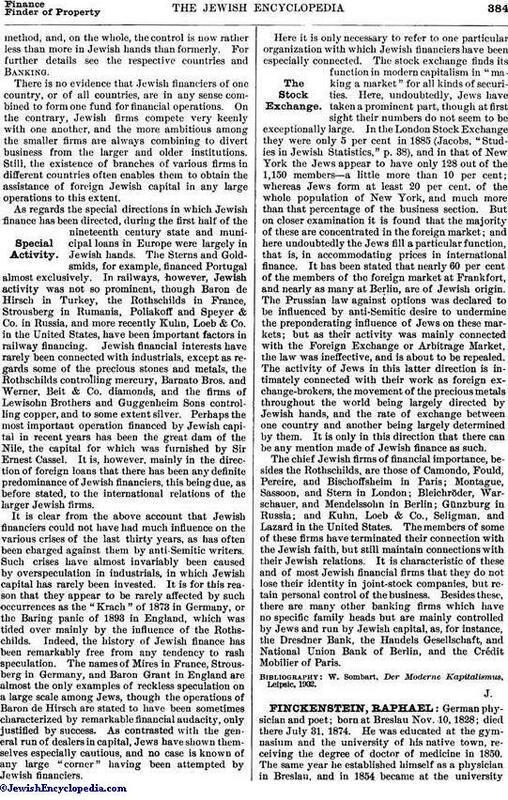 By this means Jewish financiers obtained an increasing share of international finance during the middle and last quarter of the nineteenth century. The head of the whole group was the Rothschild family, for whose operations see Rothschild. Of more recent years non-Jewish financiers have learned the same cosmopolitanmethod, and, on the whole, the control is now rather less than more in Jewish hands than formerly. For further details see the respective countries and Banking. There is no evidence that Jewish financiers of one country, or of all countries, are in any sense combined to form one fund for financial operations. On the contrary, Jewish firms compete very keenly with one another, and the more ambitious among the smaller firms are always combining to divert business from the larger and older institutions. Still, the existence of branches of various firms in different countries often enables them to obtain the assistance of foreign Jewish capital in any large operations to this extent. As regards the special directions in which Jewish finance has been directed, during the first half of the nineteenth century state and municipal loans in Europe were largely in Jewish hands. The Sterns and Goldsmids, for example, financed Portugal almost exclusively. In railways, however, Jewish activity was not so prominent, though Baron de Hirsch in Turkey, the Rothschilds in France, Strousberg in Rumania, Poliakoff and Speyer & Co. in Russia, and more recently Kuhn, Loeb & Co. in the United States, have been important factors in railway financing. Jewish financial interests have rarely been connected with industrials, except as regards some of the precious stones and metals, the Rothschilds controlling mercury, Barnato Bros. and Werner, Beit & Co. diamonds, and the firms of Lewisohn Brothers and Guggenheim Sons controlling copper, and to some extent silver. Perhaps the most important operation financed by Jewish capital in recent years has been the great dam of the Nile, the capital for which was furnished by Sir Ernest Cassel. It is, however, mainly in the direction of foreign loans that there has been any definite predominance of Jewish financiers, this being due, as before stated, to the international relations of the larger Jewish firms. It is clear from the above account that Jewish financiers could not have had much influence on the various crises of the last thirty years, as has often been charged against them by anti-Semitic writers. Such crises have almost invariably been caused by overspeculation in industrials, in which Jewish capital has rarely been invested. It is for this reason that they appear to be rarely affected by such occurrences as the "Krach" of 1873 in Germany, or the Baring panic of 1893 in England, which was tided over mainly by the influence of the Rothschilds. Indeed, the history of Jewish finance has been remarkably free from any tendency to rash speculation. The names of Mires in France, Strousberg in Germany, and Baron Grant in England are almost the only examples of reckless speculation on a large scale among Jews, though the operations of Baron de Hirsch are stated to have been sometimes characterized by remarkable financial audacity, only justified by success. As contrasted with the general run of dealers in capital, Jews have shown themselves especially cautious, and no case is known of any large "corner" having been attempted by Jewish financiers. Here it is only necessary to refer to one particular organization with which Jewish financiers have been especially connected. The stock exchange finds its function in modern capitalism in "making a market" for all kinds of securities. Here, undoubtedly, Jews have taken a prominent part, though at first sight their numbers do not seem to be exceptionally large. In the London Stock Exchange they were only 5 per cent in 1885 (Jacobs, "Studies in Jewish Statistics," p. 38), and in that of New York the Jews appear to have only 128 out of the 1,150 members—a little more than 10 per cent; whereas Jews form at least 20 per cent. of the whole population of New York, and much more than that percentage of the business section. But on closer examination it is found that the majority of these are concentrated in the foreign market; and here undoubtedly the Jews fill a particular function, that is, in accommodating prices in international finance. It has been stated that nearly 60 per cent of the members of the foreign market at Frankfort, and nearly as many at Berlin, are of Jewish origin. The Prussian law against options was declared to be influenced by anti-Semitic desire to undermine the preponderating influence of Jews on these markets; but as their activity was mainly connected with the Foreign Exchange or Arbitrage Market, the law was ineffective, and is about to be repealed. The activity of Jews in this latter direction is intimately connected with their work as foreign exchange-brokers, the movement of the precious metals throughout the world being largely directed by Jewish hands, and the rate of exchange between one country and another being largely determined by them. It is only in this direction that there can be any mention made of Jewish finance as such. The chief Jewish firms of financial importance, besides the Rothschilds, are those of Camondo, Fould, Pereire, and Bischoffsheim in Paris; Montague, Sassoon, and Stern in London; Bleichröder, Warschauer, and Mendelssohn in Berlin; Günzburg in Russia; and Kuhn, Loeb & Co., Seligman, and Lazard in the United States. The members of some of these firms have terminated their connection with the Jewish faith, but still maintain connections with their Jewish relations. It is characteristic of these and of most Jewish financial firms that they do not lose their identity in joint-stock companies, but retain personal control of the business. Besides these, there are many other banking firms which have no specific family heads but are mainly controlled by Jews and run by Jewish capital, as, for instance, the Dresdner Bank, the Handels Gesellschaft, and National Union Bank of Berlin, and the Crédit Mobilier of Paris. W. Sombart, Der Moderne Kapitalismus, Leipsic, 1902.